Between 1990 and 2016, in a small Ohio town of 16,500 people, I started, ran, and sold my event business, All Occasions Plus, LLC. 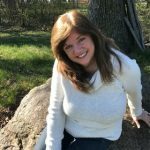 The purpose for this page is to give you an idea of the types of experience, and thus perspectives, from which this site, my services, and my blog come. THE AREA: The area is primarily blue-collar and farm land. There is a mall, a private college, your typical fast-food restaurants, and 3 big-box stores. Most high schools in the area have graduating classes of around 100 or less. There are no convention centers or fancy hotels. Wedding receptions are held in halls such as an UAW, VFW, DAV, Knights of Columbus, Eagles, Elks, Fairground Buildings, etc. The average wedding reception is about 250 guests, with a few at 400-500 guests. 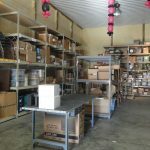 The bulk of our business was within a 40 mile radius. 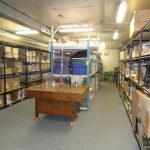 OUR FACILITY: I started and nurtured the business home-based for 5 years until there were sufficient bookings that I felt comfortable enough to rent a space on the out-skirts of town. Later I purchased a building where we stayed for 14 years until purchasing a larger building on the same street. 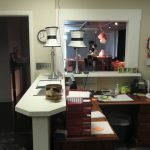 The first shop consisted of a showroom, a consultation room, work space, warehouse, 2 offices, and a break area. 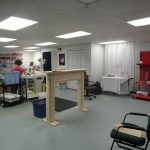 Our second shop, (shown above) about 6000 sq. ft., also had a dedicated Balloon Room, a Centerpiece Design Room, additional Office and Warehouse areas, plus a Laundry space. 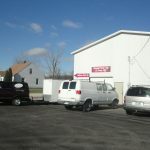 We had 3 vans and an enclosed trailer. 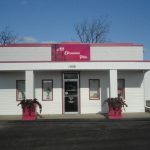 OUR STAFF: There was a full-time office girl that took care of customer service, bookkeeping, and order fulfillment. We had a designer that worked on an as-needed basis that did centerpieces, custom pieces, and floral. Our wedding coordinator/designer worked on commission, and performed the full realm of duties overseeing the weddings. A warehouse person did all of our loading, unloading, and keeping the warehouse orderly. We kept a part-time lady that took care of laundry and the cleaning/preparing of the rentals. A team of decorators, and a post-party crew members worked the events on-site. 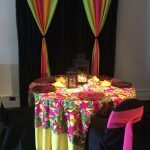 OUR SERVICES: Our two main services were Complete On-site Decorating and Decorative Event Rentals. 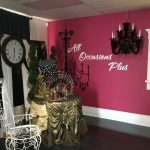 We offered a full line of Balloon Services (Balloon Drops, Exploding Balloons, Balloon Bouquet Pick-up and Deliveries, Balloon Sculptures, and Decor-to-Go) Our E-Bay store was small but worth having. We also Built Props, Customized Rentals, and provided Silk Wedding Floral. 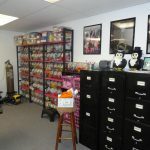 Our shop was the place to go for Custom Gifts such as diaper cakes, candy bouquets, lottery bouquets, stuffed balloons, money roses, and fancy bows. We had minimal retail, and offered services such as consulting, event coordinating, and classes. TYPES OF EVENTS: We did mostly weddings and school events (Proms, Homecomings, and Dances) with some corporate work. Graduation and Birthday Parties kept us busy too. Fundraisers, showers, holiday parties and other miscellaneous events also came into play. Our highest dollar event was $30,000. Our most economical full event decor was $350 (Decor-to-go with customer pickup and setup). The highest selling centerpiece was $165 with our most economical centerpiece priced $3, and $10-$20 was the average. $3,500 would get you our most popular on-site decorating package for weddings. It included the entrance, all specialty tables, 2 backdrops, the dance-floor perimeter or ceiling treatment. THE BIG CHEESE: … or just Cheese, my staff called me. Most small businesses fail and very few female-owned businesses ever gross over $100,000/yr. – Failure was NEVER an option. You can only grow a business to the level that you are mentally capable – Thus, I engaged in business coaching and continuous learning. You can’t do everything – Thus, you surround yourself with good people. I had a great staff. You never work a day in your life if you enjoy what you do. My passion for what I did ran through my veins. Not to dismiss the frustrations and stress, but rather I focused on the satisfactions of every job and amount of happiness that I was able to bring into other peoples’ lives. If you’re tempted to pursue a similar endeavor, feel free to contact me and/or take advantage of a free phone call listed on my SERVICES page. I’d love to hear your ideas! …. and I’d also love to have you “Join the Party” below! Success! Now check your email to confirm your subscription and start your download.